First of all, it is necessary to know that juices are only health-giving when we speak about extracting those directly from fruits or vegetables ourselves or buy freshly juiced ones. In all other cases, such as juice drink, juice cocktail or juice-flavored beverage, the products actually contain very small and insignificant to our health amount of juice while having big amounts of water and sweetener(s). These products are very rich in sugar and, therefore, are high-calorie ones. Moreover, they don’t even make it close to the amount of nutrients fresh juices have. So these are to better be completely excluded from your diet. 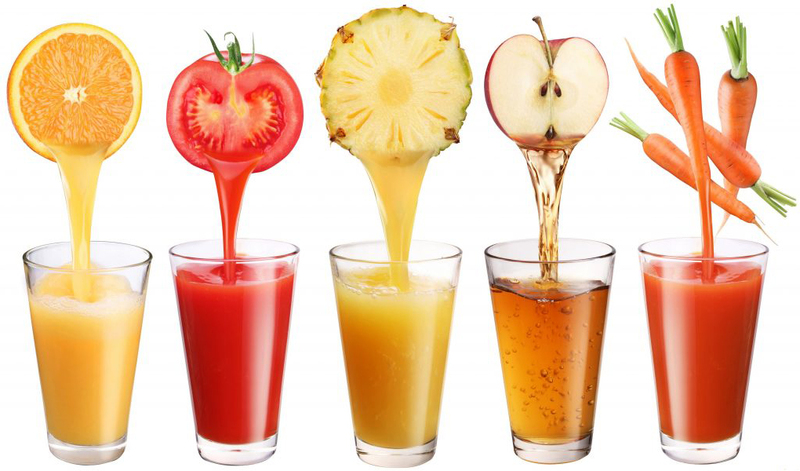 So, good juices are those that have been just extracted from fruits or vegetables. And though drinking fresh juices is still not better than eating the whole fruit or vegetable instead, it does possess certain benefits. For example, juices contain all nutrients that whole foods do, except for fiber that remains in a pulp. Fortunately, you can easily eliminate this disadvantage by either adding the cut pulp back into juice or simply blending the food instead of squeezing the juice out of it. It will at the same time make buying a juicer unnecessary and help you feel full after just a glass of juice thanks to fiber, which can be highly beneficial for people trying to reduce their daily food intake in order to lose weight. Moreover, juices can still make it to your diet in case you don’t like certain fruits or vegetables (e.g., grapefruit, tomatoes etc.). Therefore, you will still be able to get all the nutrients these foods have to offer. The only thing is that you have to drink the juice the same day you squeezed it, because it is a fertile ground for bacteria development. Also, blender of squeezing machine has to be thoroughly washed after every use. Still, there are many juices to choose from. But some have proven to be extremely helpful to us. For instance, tomato juice contains lycopene that may reduce risk of developing prostate cancer. Pomegranate juice is high in calories and very rich with antioxidants that are very effective in beating our body’s free radicals (natural by-products of metabolism that may make damage to our systems and result into oxidative stress or developing cardiovascular issues, cancer etc.). Cranberry juice is a great source of vitamin C and may also be a protection against urinary tract infections. Red grape juice is rich with flavonoids and resveratrol that support our heart’s work. Orange juice is also full of vitamin C and has some antioxidants as a bonus. Last but not least, it is important not to overdose, especially when it comes to children. The American Academy of Pediatrics’ recommendations state that optimal amount of juice for kids younger than 6 years old is 4 to 6 ounces a day, and for kids between 7 and 18 the number is 8-12 ounces. If juices are too strong or sour, it is perfectly okay to add some water or sugar (but not too much of the latter!). 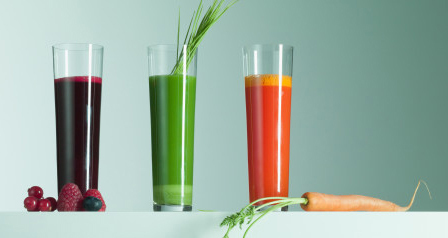 For adults it is also good to remember not to try replacing regular food intake with juices. So it is better to limit their overall amount of juice glasses per day as well.